Elizabethtown Police Lt. Joe Ditzler is set to say goodbye to a 30-year career as a police officer at the end of this month when he retires. Last Thursday, Ditzler was recognized at Borough Council's meeting with a number of resolutions. Perhaps the highlight was a resolution from U.S. Senator Pat Toomey, presented by Ditzler's son, Jeff, who works for Toomey. Ditzler joined the Elizabethtown Police Department in November 1982 and was appointed to detective 10 years later. In April 2002, he was promoted to the lieutenant's post. 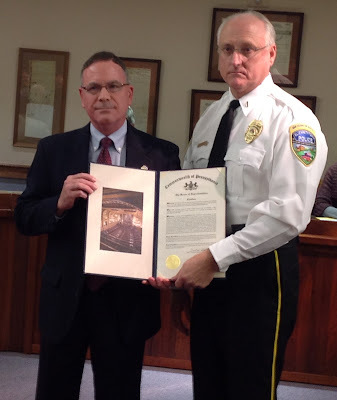 Police Chief Jack Mentzer said Ditzler "epitomizes the attitude 'duty before self.'" "He has investigated and successfully prosecuted some of the most serious crimes that our community has unfortunately experienced," Mentzer said. "He has completed these duties with integrity, loyalty, professionalism and distinction." He was instrumental in establishing the department's Youth Aid Program, which was the first of its kind in Lancaster County at the time. He also served as the department's forensic specialist, photographer and evidence technician and custodian. Most recently, he trained staff and administrators at the Elizabethtown Area School District in Alert Lockdown Inform County Evacuate, which the district adopted as its official response for certain incidents within the schools. It's great to know the community has people like Joe Ditzler who are sworn to serve and protect us. He has clearly done a great job, and I wish him well in his retirement. You've definitely earned it, Lieutenant.